1. Form a three inch coil with seven turns. Secure into a round shape with ties or tape. The attached alligator clip shown below will be connected to no less than 60′ of your antenna wire. 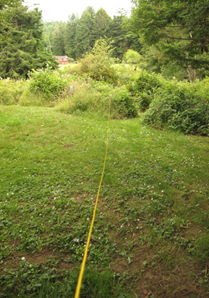 Generally the longer the antenna wire the better so if you have a 100′ antenna wire, that’s good. 2. The other end (not shown) of the coil will go to the ground stake so leave enough wire. 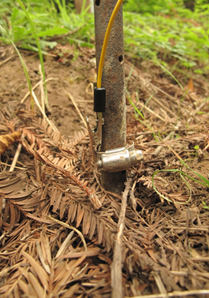 The ground stake can be driven into a convenient and safe place nearby. 3. For maximum reception, stretch the antenna wire out perpendicular to the station you want to listen to. That means if you draw a make-believe line toward the station, you want to lay the antenna wire out 90 degrees to that imaginary line. You can mount the wire at any height, but consider eight feet for safety. 4. Bare the end of the antenna wire (I use a knife or diagonal pliers) and clip it to the coil. You really don’t need the alligator clips, but it is much more reliable than twisting wire together. 5. Our antenna did not work on the pipe we used until we sanded the rust away on a small section under the clamp. What you can’t see is that the dirt is damp. This is also important to make the ground work. If you have bone dry soil you may have to dump quite a bit of water on the dirt to make the soil more conductive. Clip the wire to the clamp. 6. Grand Magic Test: Tune your radio to a very weak station. You don’t need a signal meter but it is fun to watch it register the gain. Move the coil near the radio until you hear the station improve. You don’t actually attach this antenna to the radio. The coil intensifies the signal which is inductively picked up by the ferrite antenna inside the radio. A 1400 KHz station in our area went from “no discernible signal” to “full power”. Please let us know of your successes or failures so fellow listeners can benefit from your experiences. 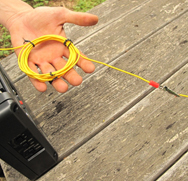 You can experiment with the diameter of the coil, the number of turns and the length of antenna wire you use. If you want to see some other great AM antennas try searching am loop antenna DIY. We would love it if you send a comment and/or picture that we can post. This antenna works great on the AM band because of the properties of these frequencies. Loop antennas can work on other frequencies also but need some modification because of the frequency property differences. There are probably some discoveries to be made in the future with loop antenna research. As always, we value your opinion and encourage questions. Please feel free to contact us or leave a comment. Thanks for the info. Even though my CCrane radio gets great AM reception, I’m going to see if it gets any better. Please call us and we’ll see what we can do to help you find a possible solution. 800-522-8863 Monday – Friday 8:30AM – 5:00PM PT. Hi there. Must the insulated wire be single strand and what diameter is recommended? Single strand or multi-strand is fine as long as it is insulated and not shielded. RG-20 or RG-22 are the grades I use. Did you mean 20 ga. or 22 ga? RG is a mil spec prefix for Radio Grade coaxial cables. I have tried this at home…but i still have a lot of noise even if i have a good ground stake….so for me it didn’t work!! I have about 100′ of wire…. Are you using copper or steel grounding steaks? Copper is the best conductor. Is the soil somewhat moist or completely dry? Slightly moist soil is better. Also is the radio run on AC or batteries? If AC, there could be 60-cycle noise that is being injected. i made these types of antennas for my 6 transistor pocket radios in the early 1960s and they worked great. magnetic ground wave antenna real quiet compaired to other antennas. If you don’t attach it to the radio, why the clip? For simplicity sake, they are just handy to use clipped onto the actual copper wire (after baring the plastic on the wire) vs. just twisting raw exposed wire together. It would behoove someone to actually have 2 sets of long wire just in case you need to adjust the coiled up wire, you wouldn’t have to walk 100+ ft. to adjust the other end of the wire attached to the metal stake & clamp. The 2nd clip can be used to clip the longer piece of the wire (around the metal stake) to the shorter wire that is coiled and near your radio. I hope this answers why the extra clip suggested. Need 1, but 1 more is helpful. Feel free to call if you have more questions. We are happy to assist further. 1-800-522-8863. In regards to any electrical advice, I need to refer you to your local Electrical contractor for advice. I’m surprised that C Crane hasn’t mention the SELECT-A-TENNA to improve AM reception. I have one that was sold by C Crane and I purchased over thirty years ago. It looks like a LP record standing on its side with a big tuneable knob in the center. You set it next to the radio and match the frequency with the one you are trying to listen to. I have one of these original gems that worked in the past on multiple radios. I loved “DX’ing” far away stations, but sadly it sits on a shelf in my closet. My original table radio died and rather than buy a new one, I decided to listen to Internet radio on my phone through RADIO apps that are available. Yes, you can hear the stations loud and clear, but it takes away from the fun and magic of “DX’ing”. Of course, you may be spending $$$ on live streaming. So, in the end, free over-the-air is the better way to go. I wonder how this works if I attach it to the ground rod that is already on the side of my home. It’s grounded to our electrical panel. In regards to any electrical advice, I need to refer you to your local Electrical contractor for advice since the ground rod is touching the panel. What about lightning? Is there a lightning arrestor needed with this design? For this question, I need to refer you to your local Electrical contractor for advice. 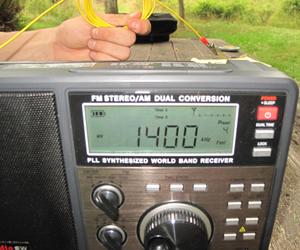 I have a long wire antenna I use for AM DX, and lightning was my first consideration. 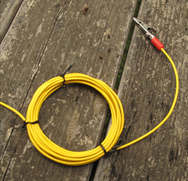 Try this: buy a spark plug and connect your long wire antenna to the “hot” terminal. Using a couple of washers and properly sized nut, attach a ground wire to what would be the threads for inserting the spark plug into the engine. I have used this for some time and am pleased with the results. It’s quick and easy and appears to work. How about describing the construction using the same principle for an indoor antenna? I understand the increase in signal strength may not be as great as your outdoor antenna but most people listen to nighttime radio indoors! In a mountain cabin in a river valley (Chewuch) in Eastern WA , 2oo miles from Seattle, is a coil of 21 turns of #22 , stranded cu, insulated hook-up wire that was wound on a Quaker Oats package and taped to keep it together. The 2 ends of the coil are soldered to a convenient length of lamp cord…it was handy and I had a whole roll of it….and the lamp cord went through a drilled hole in the outside wall of the cabin.. The twin wire lamp cord was separated and one wire clamped to the power pole ground stake….any clean pipe, rod. aluminum ski pole, etc. will work in moist ground, the river is 59f’ away… My antenna is strung between 2 trees about as high as I could pitch a rock with fishing line attached… for mountain AM, height is good…and the cabin end is connected to the down lead and an insulator. The far end is about 150′ away and oriented NW/SE for the desired distant stations, WA is the NW corner ‘ya know, and is connected to a piece of monofilament way too big to fish with and it runs over a limb of the tree and to a swinging rock near ground…keeps it tight and allows the wind to blow the trees around. The wire was originally cu stranded antenna wire but replaced by 0.032 SS safety wire after snow load limb breakage. The down lead is connected to the other wire of the lamp cord. So the antenna is connected to the down lead and the down lead is hooked to the twin lead and into the cabin to one end of the coil and the other coil end goes back outside to ground and the circuit is complete and … ‘Bob’s your uncle’ !! I hang the coil over the FM antenna, useless there, and during the day get most serious Seattle stations and Vancouver and Salt Lake …..on my original CC Radio , the one that has 13 channels of TV sound. I have several later CC Radios but I wouldn’t leave them in a mountain cabin. At night…CA, NV ,TX too many to count….some are ‘skips’, some are not, but the clarity and quality is outstanding. I have, and lately, most of the cabin folk over there, used this system since the early ’70’s and someone said it came from Alaska where they reached for stations down south. I would like to try this antenna, however, I live in the Arizona desert and have no way to install a ground rod into moist soil. Any ideas? Any soil, even if dry is better than nothing. Also if you get it into the dry soil you could always use a garden hose on it once in a while. I’m off-grid, and wondering if this antenna booster can significantly improve battery life by lowering current consumption since the AGC isn’t always employing such a large amplification. If so, how much affect can it have? I suppose it would depend on where the AGC is, and I’m showing my lack of understanding of AM circuits, since I don’t know exactly where the AGC is. Is it before the detector? Don’t forget the usefulness of Cat 3, Cat 5, or Cat 6 wire. All of these wires will cover the so called “AM” band very well and can be used as “transmission line” somewhat like a coaxial cable would carry your TV signal from a rooftop TV antenna to your TV receiver.